WHY CHOOSE STEEL FRAME HOME CONSTRUCTION? Zincalume steel possesses the highest strength to weight ratio of any building material being utilized today. It remains one of the strongest, most durable and economically manufactured materials. The majority of commercial buildings are constructed from steel frames, and for good reason. Stronger, straighter and longer lasting than traditional timber frames, steel frames are non-combustible, termite proof and unaffected by damp, dry mould or rot, making them an undeniably superior choice. 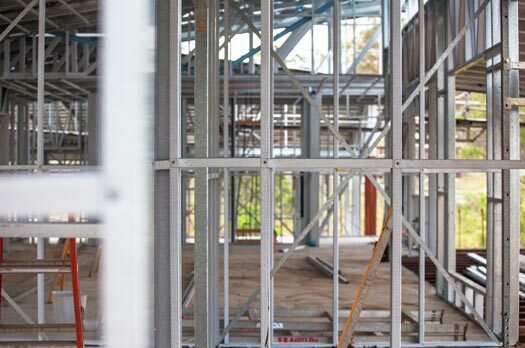 BlueScope Steel provides a 50 year warranty for its TrueCore®Steel used correctly in steel house frames. A preferred framing material with many builders, steel framing is the only framing material for which any kind of structural durability warranty is offered and performs well in any climate. Steel frames make an ideal choice for extreme environments with highly variable temperatures from 1–40˚ Celsius. All of these characteristics can add real value to your building. There are many reasons to choose steel frames and trusses for your next project. Steel frames boast superior quality, durability, ease of use, design freedom, safety and are an environmentally friendly and economical choice. Choosing a steel frame improves your resale value. A superior, modern, fully structurally engineered house frame made of steel easily stands the test of time. It is possible to produce designs in steel that cannot be done with other materials—longer spans, more open spaces, and larger spaces are all possible. When you compare timber to steel framing—which comes complete with bracing panels, tie downs, pre-punched service holes and lintels over windows—steel wins every time. There’s no shrinkage, no warping, it’s lighter to handle, non-combustible and impervious to termites. 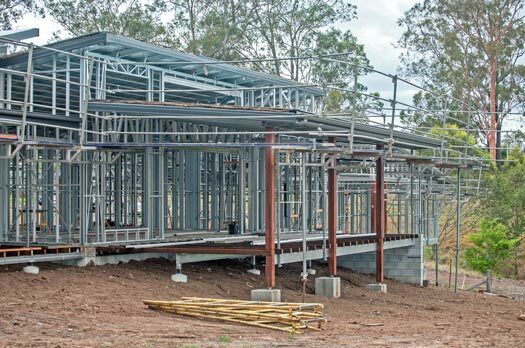 Steel frames are now the norm in house building. But traditional joining techniques, like MIG-welding, blind-riveting and bolting, are proving too costly, slow and unreliable. Manufacturers worldwide are turning to HSPR for their steel frames, lintel, floor joists and roof trusses. Using HSPR means no fumes and a clean working environment. It’s a cold joining process, so the zinc coating on the galvanized steel does not get burnt, maintaining the frame’s corrosion resistance. With no requirements for holes, there are no subsequent alignment problems, making it a fast, one-shot process that gives a consistent, high-quality joint.